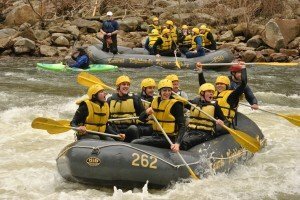 Ohiopyle is gearing up for white water rafting! Beautiful winter day looking down onto Entrance Rapid. 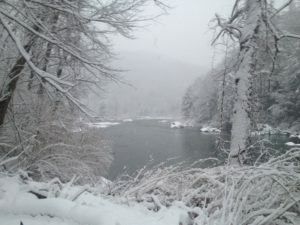 While we are enduring the remaining bits of winter weather, Spring is definitely in the air here in Ohiopyle. And you know what that means…. The 2014 white water rafting season is about to start! This winter has really been one for the record books. On the bright side, all the snow and rain have really helped keep the water table FULL! We are really counting on the old saying, “In like a lion, out like a lamb” applying for March. This is the perfect recipe for GREAT springtime rafting! Don’t miss our season opening Ice-Breaker Weekend April 4-5! (We are hoping the ice-breaker part is just a joke…) Trips are already starting to book up. We are looking forward to some fun high-water days on the Cheat River in Albright, WV, and on the Lower Yough in Ohiopyle, PA. And we can’t wait!! Spring rafting is not an adventure to be missed. You can take advantage of great water levels and low crowd levels, making each trip a unique experience. Don’t be scared of the cooler temperatures either! We have wetsuits available to rent at check-in, and Under Armour should be your best friend. The more layers the better! Wool and fleece socks with tennis shoes, and fleece gloves help keep the tips of your limbs nice and toasty. As if we needed to entice you any further we are offering our Pay Early, Save Big! Special. Make your reservations online with full payment by May 1st and receive 15% off! AND as a bonus to our blog readers, get $5 off your wetsuit rentals! Just enter code PEDB to take advantage of these great deals!